Best Loved Stories, Finally set free! Forever to exist in a damp, musty, crumbling basement…knowing that the sun was shining outside. That its golden light was filtering through the trees onto a lovely flower garden, alive with birds–hopping and teetering from feeder to feeder. Never to lean back on an elbow in the lush green grass again, to close my eyes and drink in the sweet vanilla fragrance of the Korean Spice blossoms: lacy, blush-pink, and lovely. I would know only darkness. Trapped. Completely alone. What if I really was cast into this deep, dark basement? Forever. That’s exactly what happened to a dear friend of mine. Emlyn was a senior citizen who took a big risk…he left a small business that he had operated for many years to enter college and earn his Bachelors Degree. During that time, something was ignited within him. He absolutely loved learning and so, at age 65, he set out to earn his Masters Degree. Just as he was hitting his stride in this adventure-of-a-lifetime, he was blind-sided by a massive stroke. Suddenly bound and helpless, he was thrown down the basement stairs, bludgeoned by each and every step, landing in a heap on the floor. Crumpled, captive and alone. What followed were many dark days: a long hospitalization, culminating in a somber visit from his physician. “I’m sorry…but due to the extent of your paralysis, your lack of progress over the course of an intensive therapy program and your complete inability to speak–you require an extremely high level of care which is only available in a nursing home. “Boom” went the basement door! Three years of speech therapy. Emlyn worked diligently, but still words did not come willingly. They were tangled up somewhere on the path between his highly active mind and the numb, lifeless lips, tongue and throat which betrayed him. Brilliant thoughts and poignant feelings were building up inside him…would they ever touch the outside world or would they simply wither away…prisoners of endless silence? Emlyn was determined that they explode into life! Somehow, they would change the world! He set to work teaching himself to write. He had lost much of his ability to spell as well as his knowledge of grammar. Fortunately, he was united with a computer and software that would conjure up whole words when he pressed just a few keys on the key board. Even with this incredible technology, this was a slow, arduous process. Emlyn would not give up; when he finally defended his Master’s Thesis, we celebrated a truly heroic victory. Although knocked into a very dark basement, he refused to live out his days there. He was a fighter who overcame many obstacles and challenged the thinking of the well-meaning people who wanted him “safe” and ”cared-for” in a nursing home. He struggled up out of the basement one step at a time, developing the strength of mind and body to lug the dead weight of paralyzed limbs out of the bed and into a wheel-chair. Out of the wheel-chair and into a motorized scooter–eventually into the driver’s seat of a little white pickup. Not only did Emlyn spend his days rolling down the streets of town in that truck, he also traveled around the state, eventually driving by himself halfway across the country. Later Emlyn took to the air and traveled to Puerto Rico and Europe! He devoted much time and energy, going into classrooms at universities and in pubic schools; zipping through the doors of senior centers and city hall. He wrote to legislators, appeared in newspaper columns and, to my delight, befriended me in our apartment complex. Emlyn engaged people everywhere he went and called them to come up out of the basement. He devoted the rest of his life to unfurling a banner of hope and liberation; it was an inspiration to others. His life was an example of what amazing things a person with disabilities could accomplish. Emlyn was determined to never just accept his disabling conditions. Nor would he merely overcome them. He would stop at nothing short of thriving: a wondrous process of fighting for and, more importantly, savoring the freedom of a rich, full life. I, too, have found myself paralyzed…though I have no good excuse. I have not been blind-sided by a massive stroke. But there are times when I simply allow low self-confidence and the fear of failure to hold me captive. I fail to exercise the many abilities I have been given as I let my fear hinder me from facing and overcoming challenges. That’s when I truly am a captive in my own “basement”. And it’s true…only I can tell my stories. And only you, can tell your stories…or do whatever it is that God has gifted you to do. To do all of those things that seem overwhelming or scary or intimidating. You see, we give each other something wonderfully unique and powerful when we offer up the very best of what we have to give. We cheat ourselves and others when we choose to be “safe”, to remain “captives”, instead of climbing up each step, out of the basement. Out of the basement and into our world, to infuse it with life! Life that is full and rich and free. Previous Post holes or heights? Wow! Your writing is so vivid. 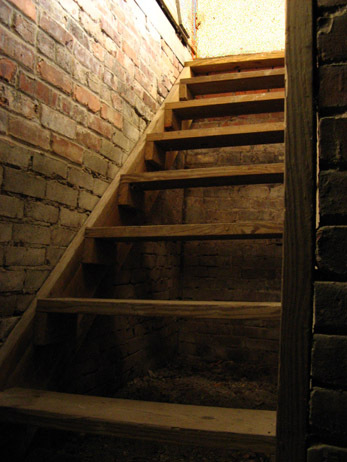 I could feel the blows as each step bludgeoned the poor man as he was thrown down the basement stairs. I’ll be sure to stop by your blog on a regular basis to treat myself to your creative mind. Thanks for stopping by to read Emlyn’s story. ‘Looking forward to sharing more stories with you.